I mean super spicy… Spicy as the one that turn your nose crimson red and brings tears in your eyes! Spicy as you are left with wiping your nose and eyes and yet you are smile and happily continue to devour the food! Yeah, I am talking of hot and fiery spicy food. If you are still reading this and nodding your head in agreement then this recipe is for you. 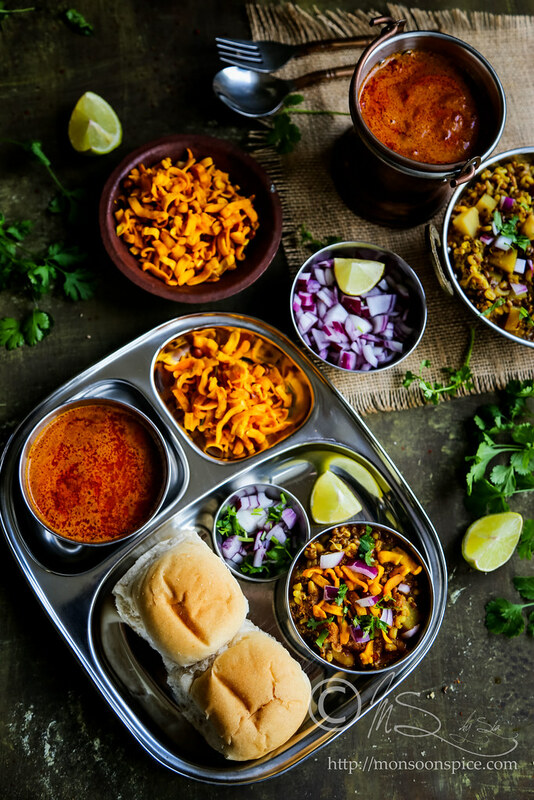 We have hot and fiery Kolhapuri Usal or Misal in our today’s menu. Last time I had it was in Belgaum where my friend took me to this small hotel in one corner of the city. It was not a fancy hotel with crystal chandeliers and comfortable chairs. Instead it was a small, modest hotel with wooden tables and long benches in a small square room with sea green coloured walls and red roof tiles. The hotel’s owner was sitting right next to the entrance door on a beautifully carved high rosewood chair. And in front of him was the ancient rosewood table with half a dozen big glass canisters filled with coloured peppermints and shortcrust cookies studded with colourful tutti-frutti. The wall behind him was adorned with frames of colourful pictures of Goddess Lakshmi (goddess of wealth), Lord Ganesha (elephant faced Hindu god) and Goddess Saraswati (goddess of knowledge). The owner himself was a pleasant looking guy with kumkum on his forehead and wore pristine white cotton kurta and dhoti. The aroma drifting from the small kitchen was enough to make me dizzy with hunger. But the hotel was packed with people occupying every possible table. Still my friend rushed inside almost dragging me along to a table occupied by two strangers. Before I could say anything, she was sitting on a bench where a middle-aged guy was eating Ragi Mudde Oota. She signalled with her eyes asking me to sit in front bench where another college student was devouring some delicious lentil gravy with pav. Within few minutes I realised that the people who had occupied that table also were total strangers and didn’t know each other but they seemed to be enjoying their meal in total silence without any awkwardness! 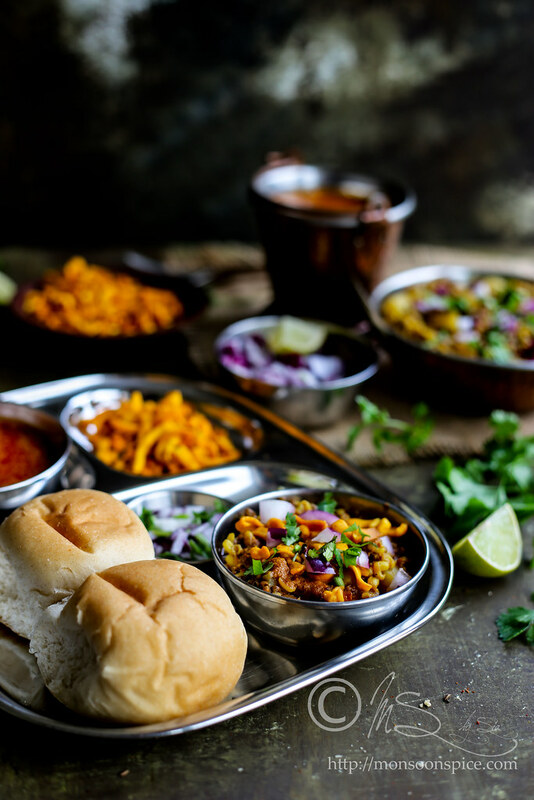 Soon my friend ordered for two plates of Kolhapuri Misal and within few minutes we were served a plateful of sprouted lentils in gravy topped with chopped onions, tomatoes and crisp farsan along with two pav buns and a small katori of fiery red curry called Kat. The server also left a tall glass of water and a big steel jar filled with water to the brim. My friend looked at me and smiled and asked me to pour some red gravy on top of sprouted lentils. She showed me how to eat it by breaking her pav into small pieces and dipping it in gravy and scooping little lentils along with chopped veggies and crunchy farsan. And what happened after that left me speechless! I was experiencing the explosion of different flavours all at once but the predominant flavour being fiery hot. There we were sitting right next to total strangers and devouring one of the spiciest food on this planet. The fiery spicy food made my eyes water and I needed my handkerchief to wipe my nose and eyes at same time! Small drops of sweat started forming on my forehead and nose and my nose matched that of circus buffoon. But still I couldn’t help but think that it was one of the best foods I have had in my life. 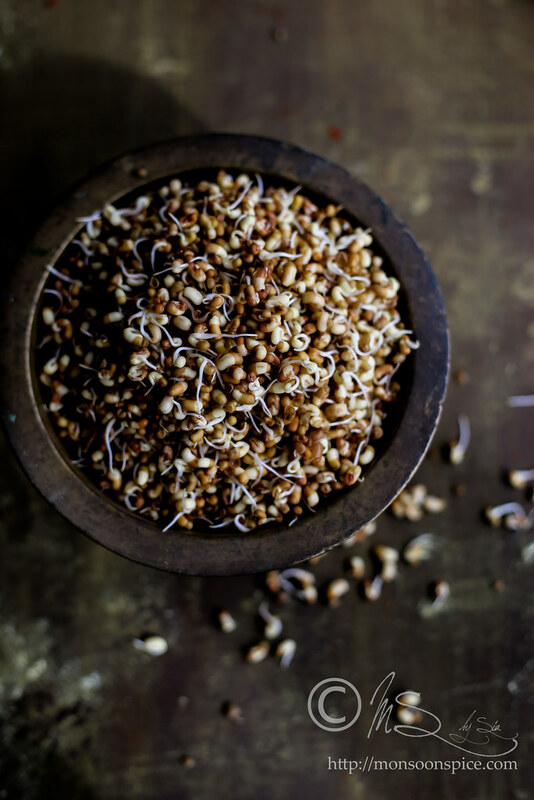 That was my first encounter with Matki or Moth Beans and the earthy taste of it made a big impact on my taste buds. 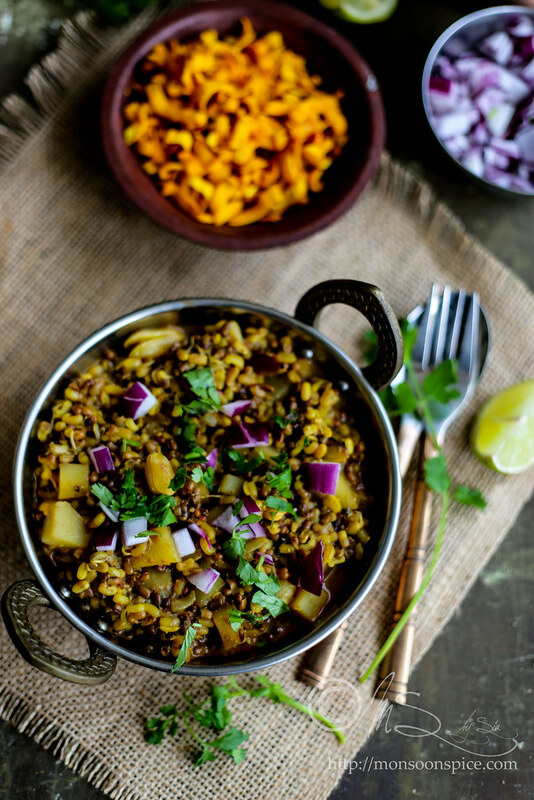 Sprouted moth beans cooked in spicy gravy along with potato was wholesome and simply delicious. And the taste of Kat, fiery spicy red gravy, served along with Misal is something that I had never experienced in my life before! By the time we both licked cleaned our plates, we had also finished drinking last drop of water from that big steel jar and were asking for more water!!! Since then it had kind of slipped from my mind until few weeks back when I received a mail from my friend reminding our wonderful days spent in hostel and the food we gorged during weekends or weekdays when we couldn’t stand the thought of chewing bullet proof chapatti with watery dal in hostel mess. Suddenly I remembered eating Kolhapuri Misal and there was nothing that could stop me from eating it except I had to Google for the recipe and cook it all by myself. While searching Google for the recipe I stumbled upon Nupur’s One Hot Stove and Vaidehi’s Chakali and I decided to cook it on weekend. A day before the cooking, I made fresh batch of Kolhapuri Masala/Chutney following Nupur’s recipe. Since then I have been using this spice powder in stir fries and curries in place of garam masala and experiencing the goodness of homemade spice powder. I cooked Usal following Nupur’s recipe and made the spicy curry Kat following Vaidehi’s recipe for Kat. 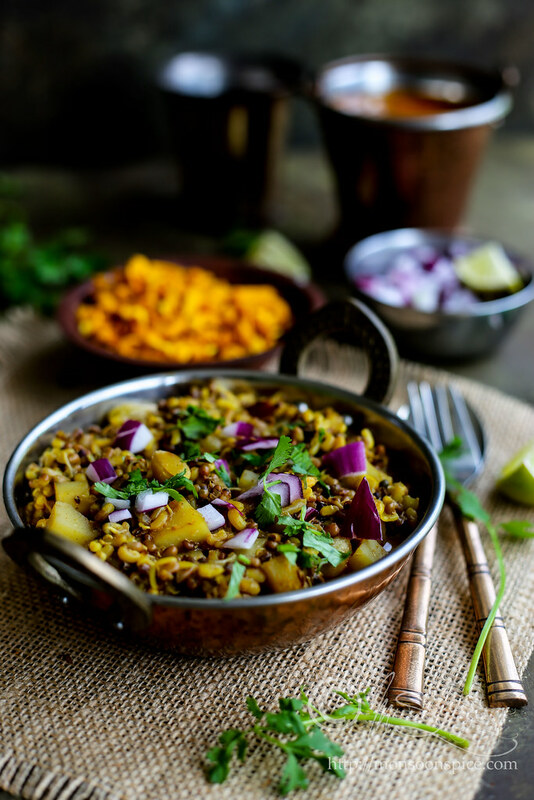 Since then I have cooked this delicious Kolhapuri Misal twice in last month and next time I am thinking of combining moong sprouts with matki sprouts. Kolhapuri Usal is a wholesome, delicious, humble food and is a must for every Marathi and spicy food lovers. 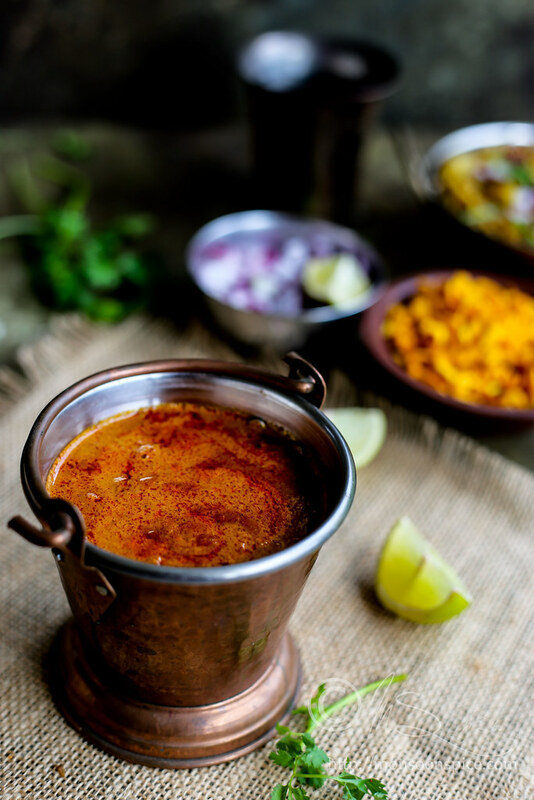 Without much delay let me give you step by step instruction on how to make this fiery hot bowl of Kolhapuri Misal. Day 1: Wash and then soak 1 cup of Matki/Moth beans in 2 cups of water in the morning. Let it soak for at least 8-10 hours. Then drain water from the beans and place them in a colander lined with damp muslin cloth. Cover the beans with the muslin cloth (like money bag) and place the colander in a dark place overnight. Make sure that the cloth is damp enough and sprinkle little water in between so that the beans don’t dry out. It usually takes 2 days (16-24 hrs) here for the beans to sprout well. So if I am planning to cook anything with sprouted beans I make sure that I prepare for it two days well in advance. You can also prepare the Kolhapuri Masala/Chutney on day one itself and store it in an air tight jar. 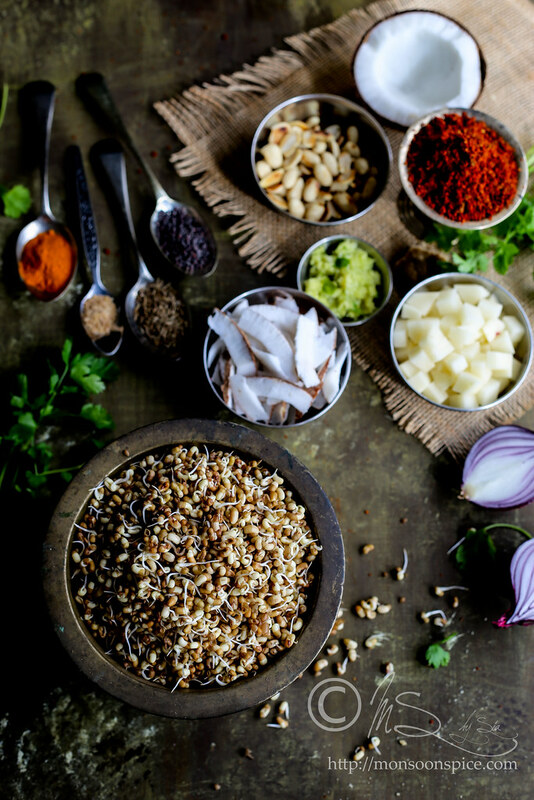 And make sure that you have got all the ingredients needed for making Misal. 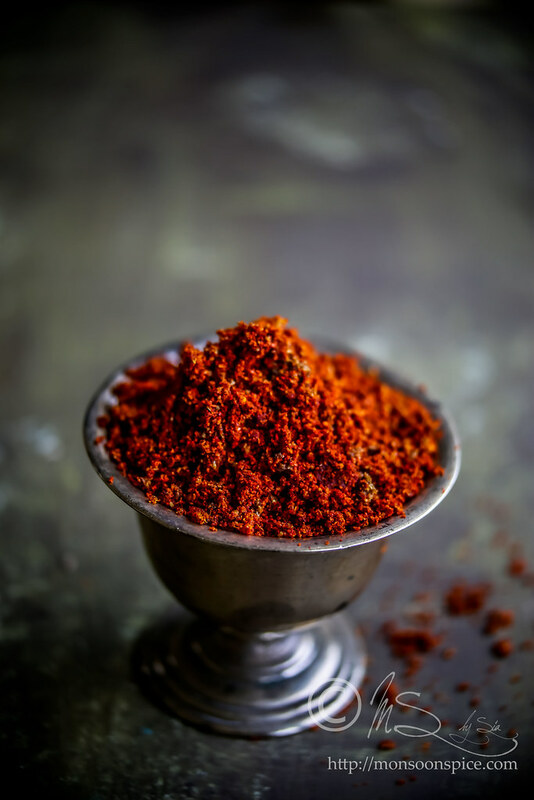 You can also make the spice powder for Kat this day or simply use Kolhapuri Masala/Chutney in its place. Day 2: This is the day you prepare Usal and Kat. Preparing Usal and Kat is very simple and straightforward since we have already prepared the Kolhapuri chutney on previous day. Over all it took me around one hour to cook and serve spicy Kolhapuri Misal with help from TH. Dry roast coriander seeds, jeera, sesame seeds, black peppercorns, cinnamon stick, cloves and fennel seeds in a skillet till they are fragrant and roasted fine, about 1-2 mins. Set it aside to cool. Heat oil in a same pan and roast finely sliced onion, garlic and coriander leaves till they are nicely browned and crisp. Set them aside to cool completely. Now grind all these ingredients to fine powder. 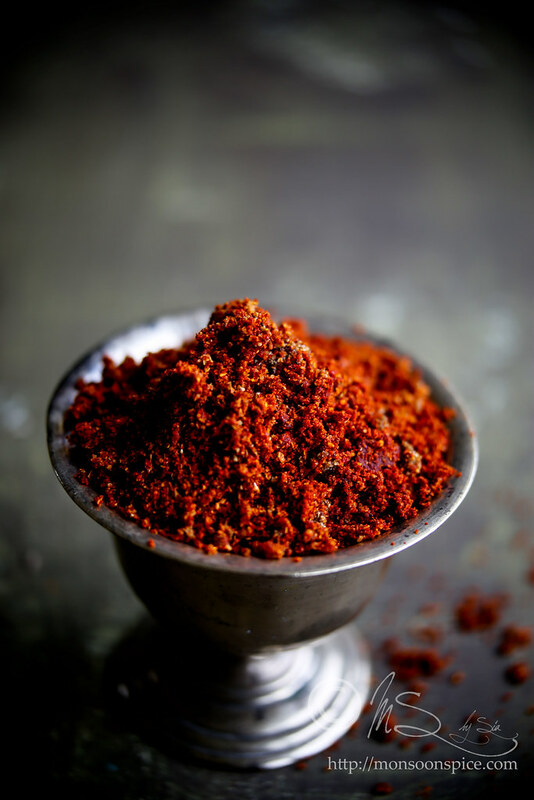 Add red chilli powder to the ground spice powder and mix them well. Cool and store this spice powder in an air-tight container in the refrigerator. 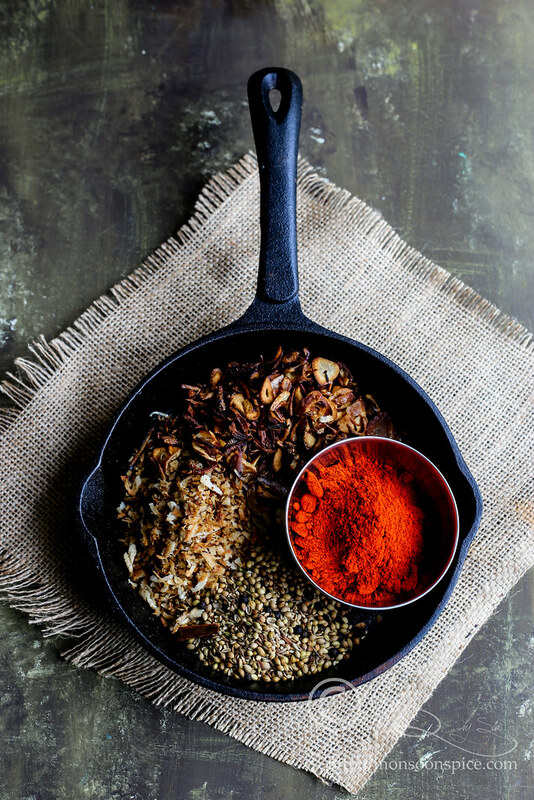 Since the spice powder is made using fresh ingredients like onion, garlic and coriander leaves, make sure that they are nicely browned (but not burnt) and dry. Or else the spice powder will have shorter shelf life. Store it in clean and dry air tight jar and keep it in refrigerator to extend its shelf life. Heat 2 tbsp oil in a pan and ground masala powder or Kolhapuri masala and sauté for couple of seconds till the raw smell disappears from spice base. Make sure that you don’t burn it. Next add finely chopped onion and tomatoes and cook for 2-3 minutes. Mix in grated coconut and cook till the mixture starts to leave oil, about 3 minutes. Cool the mixture completely and grind to smooth paste adding little water at time. Heat 1-2 tbsp of oil in a pan and add turmeric powder, chilli powder and hing. Immediately add the Kat paste and about ¾-1 cup of water and mix well. Mix in kokum/tamarind paste and salt to taste and bring the whole mixture to boil. Turn off the heat and keep it aside till needed. First prepare Kolhapuri Masala/Chutney paste. Heat oil in a pan and add finely chopped onion. Sauté the onion till it turn golden brown. Then add grated coconut and Kolhapuri masala and sauté till the coconut turns golden brown. Cool this mixture and then grind to smooth paste adding little water at time. Keep it aside until needed. Peel and dice the potato into 1 cm cubes and keep them immersed in a bowl of water to prevent them from decolouring. Heat oil in a pan and add mustard seeds to it. When it starts to pop and splutter, add cumin seeds, hing and curry leaves. Sauté till cumin turns golden and then add chopped onions to it. 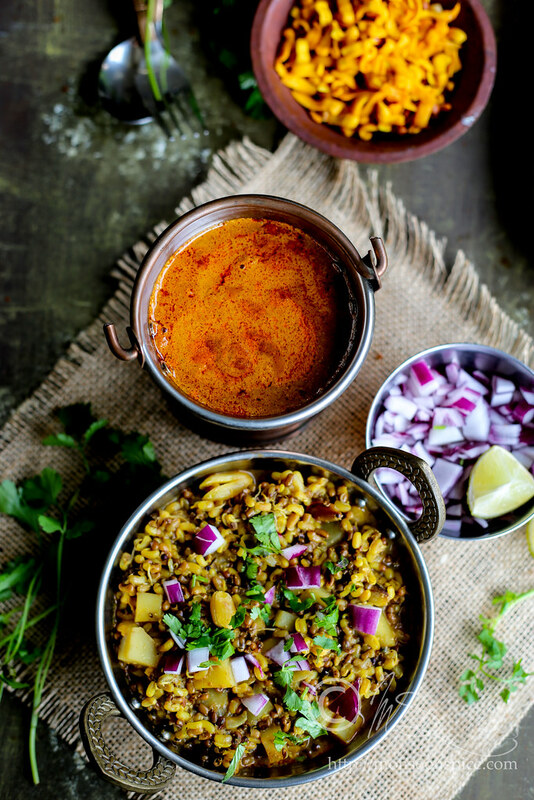 When onions turn translucent, add peanuts, sprouts, potato, turmeric powder, ground Kolhapuri masala paste and salt. Keep stirring for couple of minutes till the masala is evenly spread. Now add 5-6 cups of water and cook in medium flame. When curry starts to boil, simmer the heat and cook till the sprouts turn tender and potatoes are cooked thoroughly. Mix in tamarind paste and jaggery and simmer for few more minutes for all the flavours to blend well. 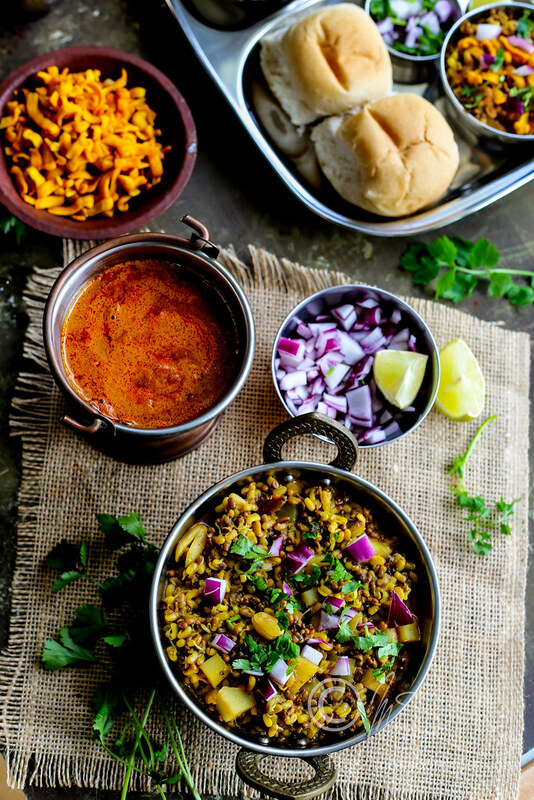 Adjust the seasonings before serving this delicious Misal. Take an individual bowl/plate and add 2 ladles full of Usal. Drizzle Kat depending on how spicy you like, yogurt, finely chopped onion, tomato and coriander leaves on top of Usal. Then add little bit of farsan/spicy mixture/crushed potato chips and serve this along lime/lemon wedges and slices of white bread/Pav. Use dry desiccated coconut if fresh/frozen coconut is not available. Use Green Moong Beans if Matki/Moth beans are not available. Make sure that you use the sprouted beans. For delicious, fulfilling meal/diet idea, serve simple Usal with a cup of cold Yogurt. You can use combination of garlic paste + coriander powder + cumin powder + red chilli powder + garam masala in place of Kolhapuri Masala. What a fine description of the modest eatery. You literally took me along with you. Mouthwatering recipe. I think its worth all the effort that goes into the making. hey such a nice read this was very nicely written hats off.. 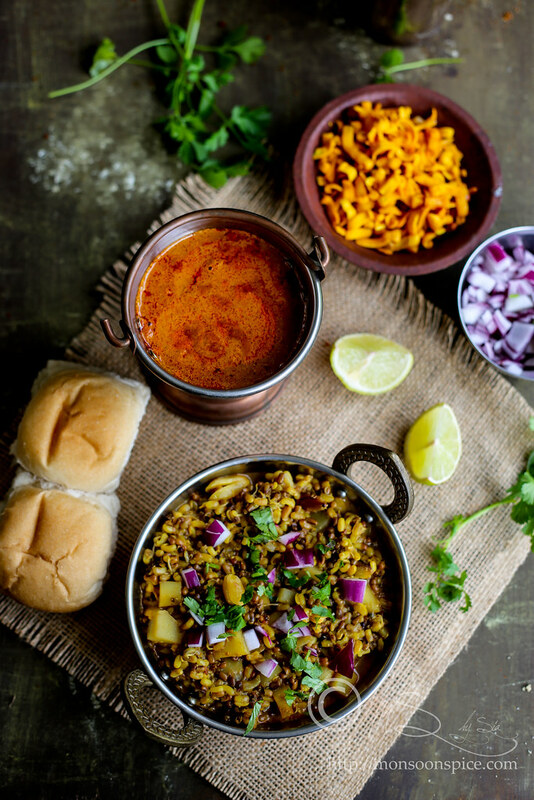 The pics are making me crave for some misal right now! This looks too spicy! And a little lengthy process too..... But will try it out sometime, for sure. BTW, i didnt get what this matki / moth beans is :S. Do u know the kannada name of it?? or some description??? I used to eat Misal almost 3 times a week for lunch in Belgaum when in college, loved the taste and I still crave for it. Now, where's the glass of water? That's hot! hot ! hot! 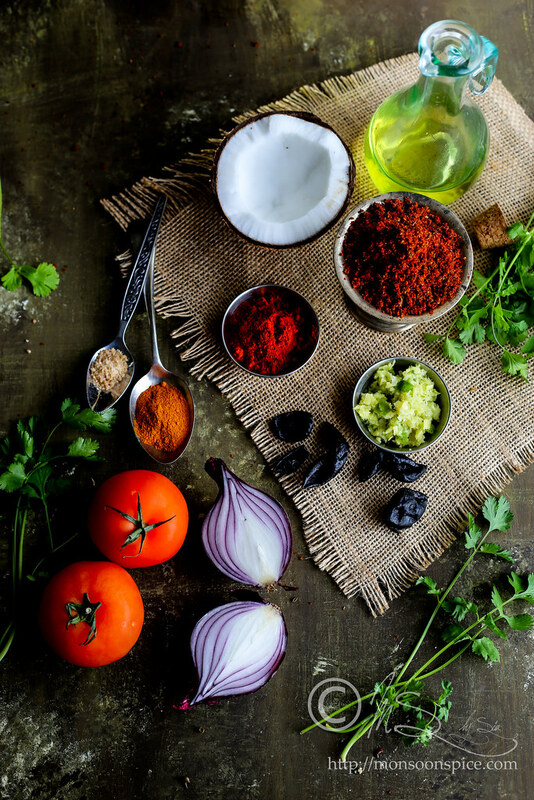 Hi, i love the way you have this fab introductions before you give out your recipies.. i have to debate if i like your writing more or recepies.. As for me when it comes to the question of spices, i forget about the nose and the eyes, i ll catch fire... i mean the whole thing.. In India I experienced sharing the hotel table with strangers... When it comes to food, only tummy is priority! 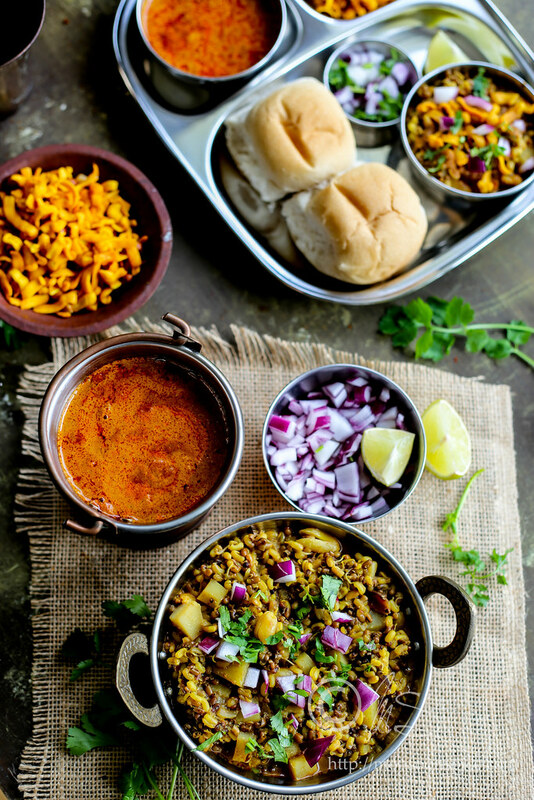 Oh gal u make me drool drool over this Hot and spicy Kolhapuri Misal! My mouth is watering just reading through the post. Yum Yum.. my husband will love this.. I'm going to make it soon. I love spicy food esp.. chaats. I am so going to try this. Looks absolutely tempting and very delicious.. I'm sure i can't handle the recipe but as usual ur pics itself is so tempting and super duper hot one cannot resist and want to go ahead. Misal looks delicious! Though I must say the ones I've had have been pretty hot but not that fiery hot! Wowie, looks amazing! I wish it didn't take so long to make, It's something I would want right away! spicy food?! me me me! I couldn't visit for the last few days, and so many recipes! Wow Sia! Yes yes yes, I would still want to have it :D..I just love it! Wonderful pics as usual. Breathtaking photos. Very nice write up. And thanks a lot for the recipe of my fav. Misal. When I read the post, I felt like I was eating the Kolhapuri Misal in the hotel with you right away! Pictures and explanations are extremely groovy! My hubby loves this snack! I love your space here..Kolhapuri misal is something new to me..i love spicy food..
Sia, Thats a lovely kolhapuri misal. Count me in the list of hot and spicy lovers... Wish those pictures could come out real from the screen... Craving for them rite now! I missed such a nice blog all these days, will surely drop in frequently to see the specials..
First of all, thanx for stopping by my pages. Appreciate it. You have one of the most amazing blogs I have seen. Kudos! Great Pics.. You really rock.. Professional look in all recipes you post, i am fan of your blog. Love to see more recipes, you remind me of indian resturant, you serve the same way as they do.. Great job..
Nice write up!!! Nice click too!!! I wish i had the same touch for the camera!! Looks so yummy and inviting!!! Wow, thatz a nice and lovely read..Clear explanation..Looks very tempting...First time here I suppose, really fell in love with your blog..
Tx for dropping at my place and ur lovely comments.. Watching that misal and not having it to eat is a sheer torture :)..Looks fantastic girl..
i am in for spicy food anytime..i don't cook too spicy at home as my 16 month old daughter also eats the same food as we do..love the colors.. I love the Kolhapuri / Belgaum Missal! Simply delicious and filling! Love your detailed presentation! Nice pics too! never had misal but have heard so much abt it. will try it soon. Yum Yum, love it anytime. I like spicy food, but not to this extent of fiery hot! :) I think that would suppress all other flavors in the dish except the HEAT! But after seeing the recipe and your pictures, I may change my mind ;-) Looks divinely delicious! Love the little story abt ur life and the descriptions made it sound so real..
Nice pics and presentation..Never heard of it...looking yummy..
Love the pic Sia! Kolhapuri cuisine is basically red chilli spicy :)If I have Kolhapuri dishes in a hotel I order 2 glasses of tall lassi with it! Your preparation looks great! 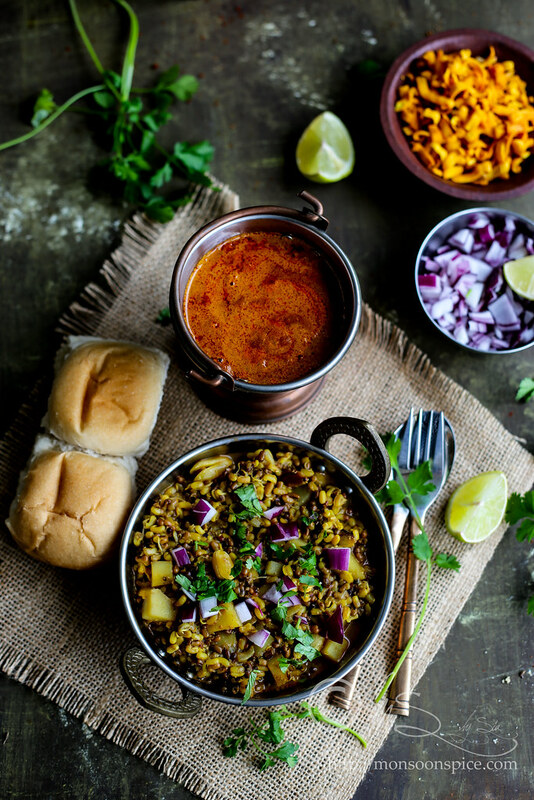 i remember having the hot spicy misal for the first time in a simialar kind of restaurant..then my mom used to make it at home,but less hot and spicy..
loved your recipe..am going to try this next weekend ..
Thats one great looking stuff sia..and enjoyed reading !.. Sia, just the talk of how spicy this was made me droooool! 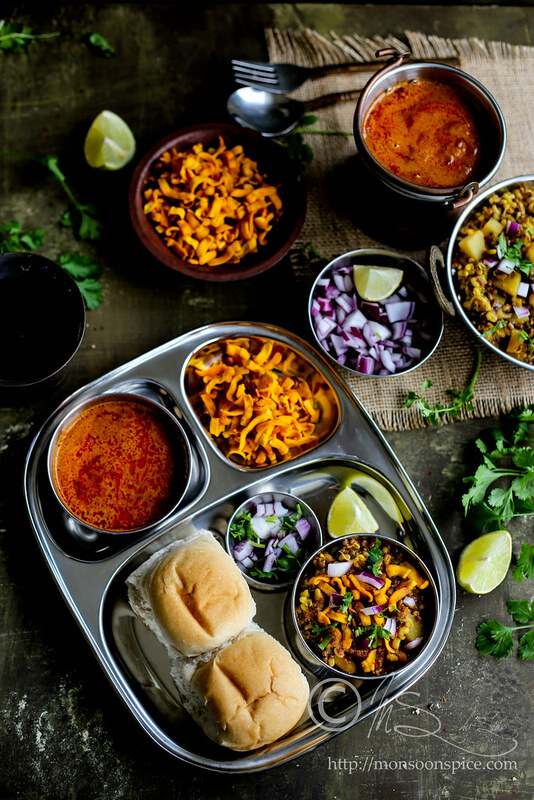 The first time I had Misal was at a friend's place and was floored, loved it! I will surely try yours. My hubby and I love super spicy food, I'm sure we will enjoy it! Thanks for sharing the recipe. these looks so yummy! and well I would prefer little less spicy ,good for my old growing stomach hehe..
and Bullet proof chapati ,hey Bhagvaan! Sia I am trying to access your Khandvi page & can't. I'll post mine soon & I want to put a link to your post since i took the recipe from u. Looks really delicious and I would like to try with the kat -- haven't heard of that before. Beautiful, colorful photos!! wowwwwww ... very nice presentation, and awesome recipe :) .. Even so, Sia, this looks like a marvelous dish that I would really love to gather the courage to try. My mouth is watering just reading your finely descriptive post. Thanks for sharing for MLLA8! Round-up will be online in a few more days. You are simply the best, Sia... I have a question. I can't seem to find moth beans nearby. Can I use whole moong instead? oops Sug, donno if I left comment in ur blog. U can use moong beans but the taste will be different from moth beans as it has more earty taste. Missal pav recipe is superb, hats off to u !!! I just love it, I have made it twice in 15 days !!! 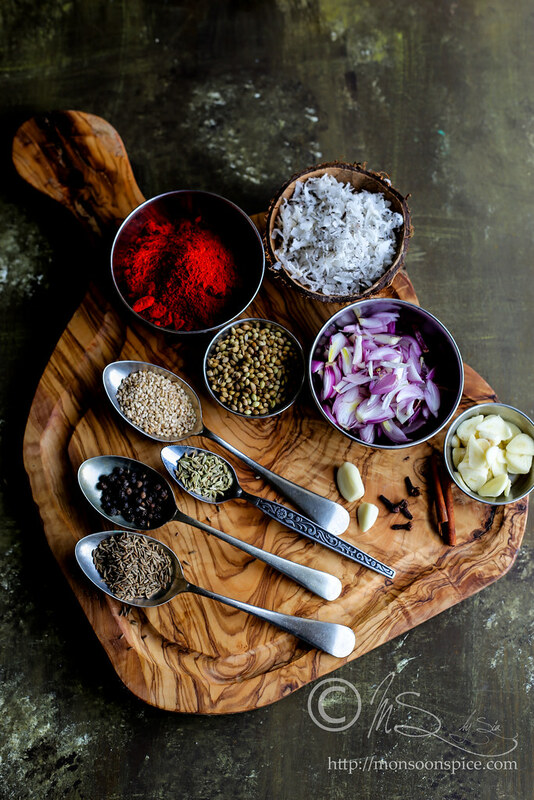 My husband and I love spicy food: especially chat items, great recipe !!! This recipe should get 150/100, simply the best !!!! Keep up the good work !! All the best !! I forgot to tell u, I m too from Belgaum !!! I love the missal pav from India Bhel House on Kirloskar Road and I miss it a lot and was very happy to get the same taste with ur recipe!!! Hi, I tried the receipe today...It came out really nice....that taste was authentic. Ever since I have moved out Bombay, this is the first time we had some real Misal Pav....Good Job!! Thank you so much for sharing such a wonderful fiery recipe. My husband is from Mumbai and he misses his street food a lot. I came across this site and had a look at this recipe. Since he loves spicy food I decided to surprise him by preparing this dish and I must say it was worth the effort and time I had put in for preparation. It turned out amazing and hubby loved it. Thanks a lot again for sharing such great cooking ideas. I made this once and we ate this for breakfast, lunch and dinner. It was so delicious. Tomorrow again I am going to make. Super presentation. Thanks a lot. @Bhagyalakshmy, how wonderful :) It's been quite some time I made it :) Can I come over to ur house to have a plate of misal? ;) just kidding... hope u enjoy it more the second time! You are most welcome Sia. Yes we all enjoyed it for the second time also. Thanks a lot for sharing this recipe. This recipe turned out very delicious.. Definitely a keeper. Awesome presentation of the recipe.I tried it yesterday...nd it bowled my family over.however I skipped one of the steps...still it turned out to be mouth-watering! Am about to try this today. Just wanted to let you know that you missed using the "2 tbsp Dry Coconut. Shredded (unsweetened variety" in the Kolhapuri Masala/Chutney Powder. BTW... is Kolhapuri Masala same as the "Ghati Masala" in mumbai? I studied in Kolhapur and back then misal was always my soul food. Lately have been craving for this a lot and my search brought me here. Will be making this soon. Just finished making and oh man it is a long recipe and lots of prepping. Still to sit and taste and wait for husband's final verdict. He is a Maharastrian and me a Gujju so spicy v/s sweet food. Looks really nice I must say. Thanks for the recipe, wished there was short cut though, Took me 1.30hrs to get everything sorted. thank you for this, great effort.